Aruba, the land of flamingoes and white sand beaches. Or so we thought. When you think of Aruba, one of the first things that come to mind are the flamingoes. That was very true for us. With the millions of photos of travelers all over the internet posing with the famous flamingoes, it is hard to look past these pretty-in-pink birds. However, this one happy island has so much more to offer. Day 1: When we first laid eyes on this beautiful island from the air, we were greeted with the beautiful blue turquoise waters and white sand beaches. 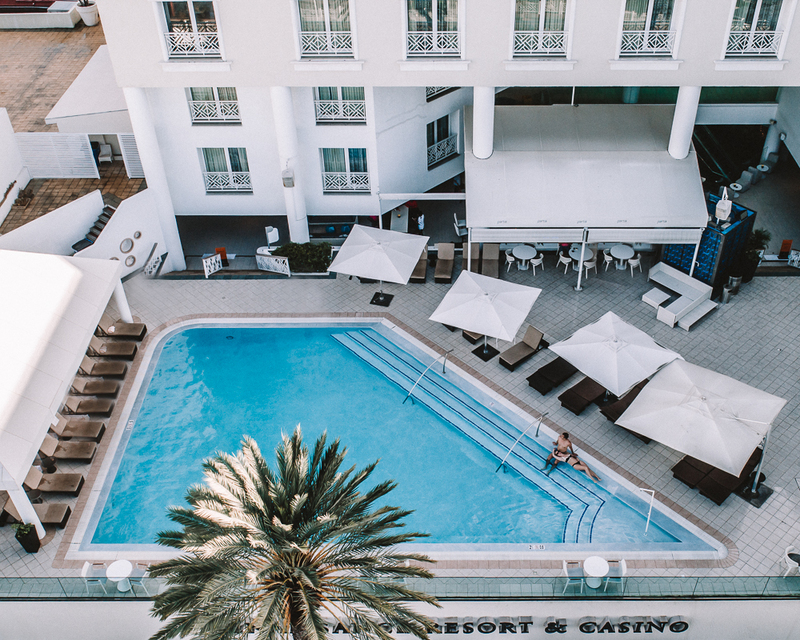 Upon arriving to our hotel, Marina Hotel (the adults only part of) Renaissance Aruba Resort & Casino, we were greeted with a friendly staff, incredible room and an overall beautiful property. We arrived in the late afternoon and once we were settled in to our room, we headed down to the beautiful BLUE Bar set by the pool for our first tropical cocktail. After drinks we headed to L.G. Smiths Steak & Chop House for a delicious 3 coursed meal. We were pleasantly surprised with the food options at Renaissance Aruba as we really had expected your typical resort food, which was not the case at all!!! And Corina being a pescatarian still had lots of food options. Since it had been a full day of travel we decided to call it an evening and retire to our room for a good nights sleep. We wanted to get to the cabana as soon as we could so we could really take advantage of the full day! Now one of the coolest things we thought was that the boat for the private island actually comes into the hotels lobby and you board it from there. It is then a quick 10min boat ride to the island. Another thing we really liked was the fact that the island is broken up into two sides. Left side for the families and the right side for adults only!! And the adults only side is where the flamingoes live!! Once we got to the island, we were escorted to our private cabana which was unbelievably amazing, and we were greeted with cold champagne. We spent the whole day there snorkeling, relaxing in the amazing over-water hammock and we even made a friend with an iguana we named Fred! When the sun started to set we decided to venture out of the private cabana area and finally go hang with the flamingoes. These pretty-in-pink birds are definitely not to be missed but just remember they are animals and do not harass them! We saw some people literally chasing them to get that perfect picture! Keep in mind that you wouldn’t want to be chased around all day for someone to get a picture with you. Anyways, after an amazing sunset and some time with the flamingoes we headed back to the hotel. We decided to have a casual dinner that night at BLUE Bar and once again very please with the food! After dinner it was straight to bed to recharge for the next day!! Day 3/4: After relaxing around the pool for a good portion of the morning we headed over to the family side of the resort called Ocean Suites for super fun lunch! We actually had a cooking class at Fresco, their open air dinning space. We learned how to make a traditional Aruban dish called Keeshi Yena. This is a chicken dish so Corina didn’t eat any but Greg thought it was delicious and can’t wait to make it at home! After a great cooking lesson and lunch we headed back to the adults only side of Renaissance Aruba Resort & Casino for an afternoon at the spa! Their spa facilities are so nice and we could have spent the whole day there! After our couples massage, getting a little steam session in and laying out on the private sundeck, we headed back up to our room to get ready for the incredible evening we had ahead of us!!! 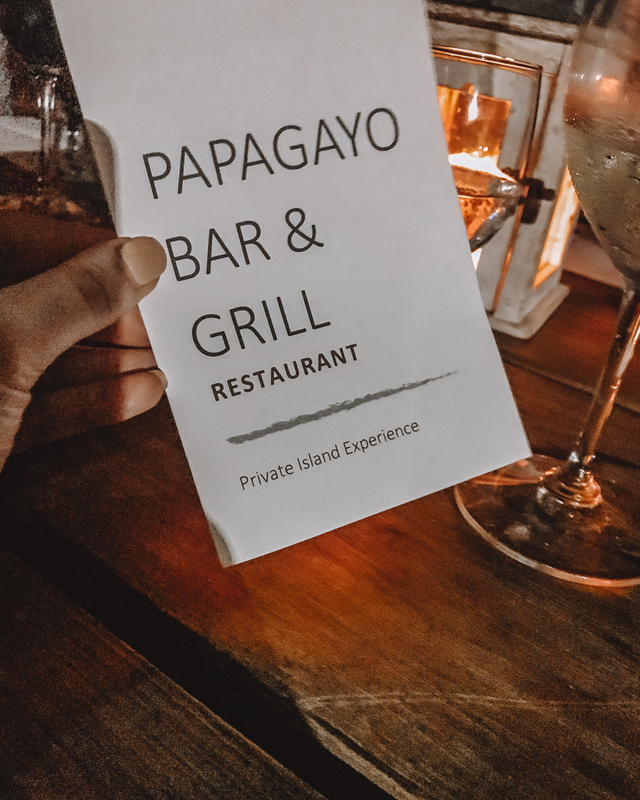 And that incredible evening was a private dinner on the private island and then an overnight experience in the cabanas! Yes you heard that right! So basically, after they close the island at 6:30pm to all other guests, they convert the last 2 cabanas into an outdoor living/bedroom area. 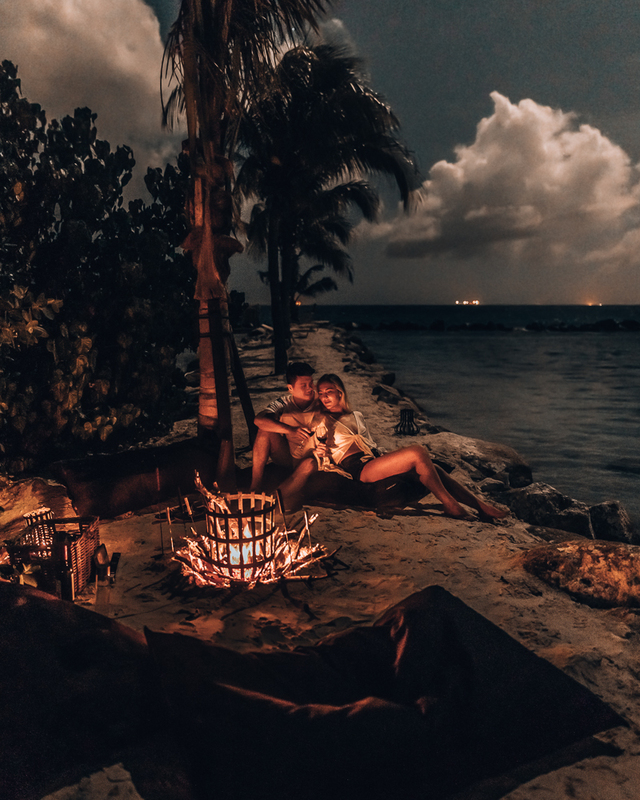 They also set up a private dinner for you on the other side of the island along with a fabulous fire pit equipped with all the essentials for making the fire along with s’mores and wine! Dinner starts around 7pm, after dinner you are escorted to the side with your cabanas and fire pit. Then everyone except one security guard leaves the island! But the security guard stays away so you actually feel like you have it all to yourselves. We didn’t see him the whole night but had a walkie-talkie to reach him if we needed to. This experience is truly a one of a kind experience you cannot get anywhere else. We highly recommended it!! After a great night’s sleep we were pleasantly woken up to a magnificent sunrise. We hung out in the cabana until about 8am when we were headed to our private breakfast, which was spectacular! It was set up in the wedding venue area away from everyone who were starting to make their way to the island for the day (note the island opens back up to other guests at 7am.) The breakfast had a mimosa and bloody mary station, omelet station, Eggs Benedict station, bagel station, all the cheese, meat, fruit, pastries one could ever ask for. They even had a smoothy station!!! After we stuffed our faces, we headed back to the hotel to unfortunately pack up and head back to cold NYC. This hotel and Aruba was so much more then we ever ever expected and we didn’t even leave the resort lol. 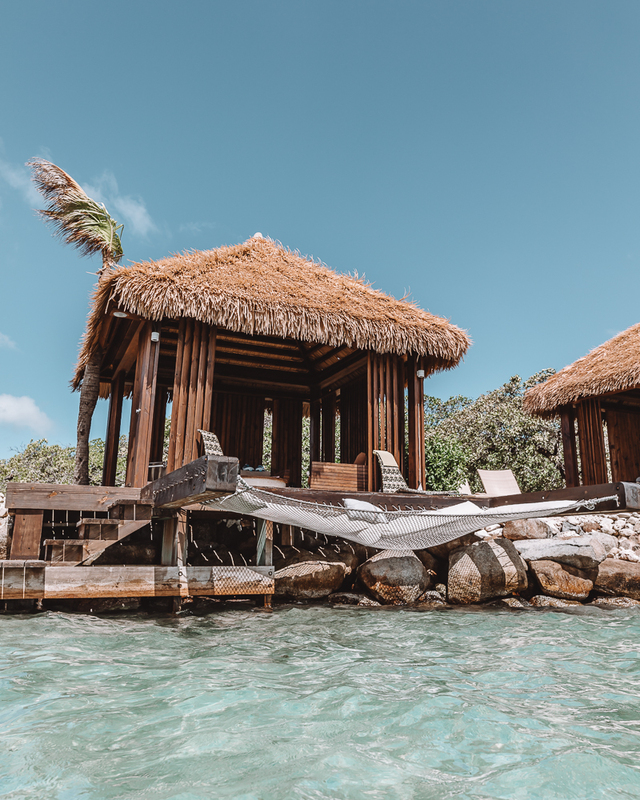 Now if you have more time and/or want to be more adventurous, you can also hike to some cool natural pools, scuba dive around a shipwreck, ATV and even paddle board in mangroves! This island is truly so diverse, beautiful and the locals are so warm and welcoming. Not once did we feel unwelcome or unsafe. We seriously cannot recommend Aruba and especially Renaissance Aruba Resort & Casino enough! BarbieAndPanda © 2018. All Rights Reserved.